Dr. Colin Forsyth is a NERC Independent Research Fellow at MSSL. He uses observations of particles, electromagnetic fields and EM radiation to understand how the Sun interacts with the space environment around the Earth. "Accelerated dreams - How particle accelerators have changed our lives...and what they will look like in the future". 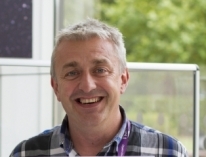 Dr Leigh Fletcher is a Royal Society Fellow and Senior Research Fellow at the University of Leicester, specialising in remote sensing of extreme environments found within giant planet systems, both in our solar system and around other stars. Why does dark matter…matter? - A critical look at one of the most controversial areas of modern physics. Dr Chris North is a physicist and astronomy at Cardiff University. In this keynote talk, Chris discusses what gravitational waves are, and how they are detected by experiments such as LIGO (Laser Interferometer Gravitational-wave Observatory). Emma's main research has focused on the giant rotating magnetosphere of Jupiter and Saturn. Careering through Astronomy What does a career in astronomy involve? Matt is the technical leadership of the planetary communications team. He also acts as QinetiQ's technical lead and system engineer for the ExoMars UHF transceiver project.